John Roddam Spencer Stanhope (1829–1908), Robin of Modern Times (1860), oil on canvas, 48.3 x 85.7 cm, Private collection. Wikimedia Commons. Another of the team of artists who painted the murals in the new Debating Hall of the Oxford Union Society was John Roddam Spencer Stanhope (1829–1908) – a member of the Pre-Raphaelite movement who, like Val Prinsep, has been largely forgotten. Stanhope’s family had artistic connections: his mother and aunts had been taught to paint by Thomas Gainsborough, and he was the uncle and teacher of Evelyn De Morgan. Like Val Prinsep, he was taught to paint by George Frederic Watts (1817-1904), and travelled with him to Italy in 1853, and to Asia Minor in 1856-7. He suffered badly from asthma, and started wintering in Florence to help his breathing. He bought the Villa Nuti in Bellosguardo, near Florence, in 1873, and moved to live there permanently in 1880. Many members of the Pre-Raphaelite movement spent time in Florence while he was there, and Marie Spartali Stillman‘s studio was next door to his. He died there in 1904. Thoughts of the Past (1859) was the first of Stanhope’s paintings to be exhibited at the Royal Academy (in 1859), and remains one of his best-known works. 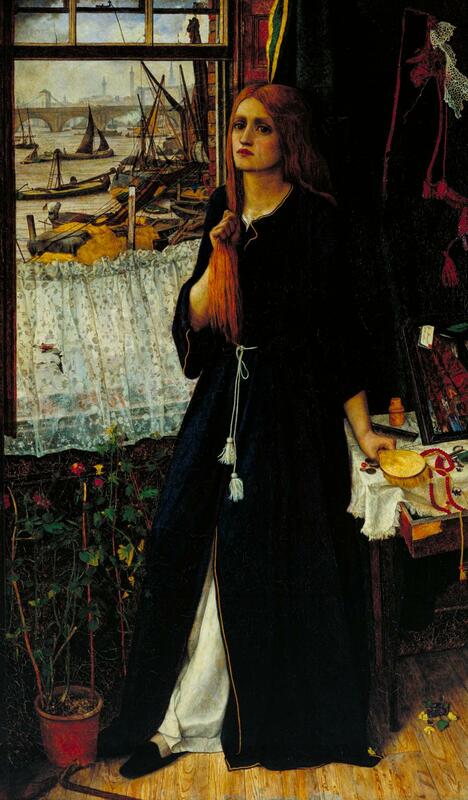 It shows a woman standing by a window which looks out onto the River Thames in London, and is a faithful depiction of the studio below that used by Dante Gabriel Rossetti at the time, at Chatham Place, London. The woman and her surroundings contain rich clues as to her status: behind her, a gaudy cloak is hanging, with some white lace. The small dressing table is tatty and covered with cheap, garish jewellery and other items. Potted houseplants straggle up for light from the window, and at their foot is a man’s glove and walking stick. She is dressed for the bedroom, her long red hair let down. A short drop of cheap and dirty net curtain is strung across the lower section of the window. She looks gaunt, her eyes tired and sunken, and stares in quiet sadness at the viewer. The view looks towards Waterloo Bridge, with the Strand embankment to the right, an area which was a popular haunt for prostitutes. Her thoughts are clearly of remorse at her shameful occupation, and her only means of redemption, that of drowning herself in the river. 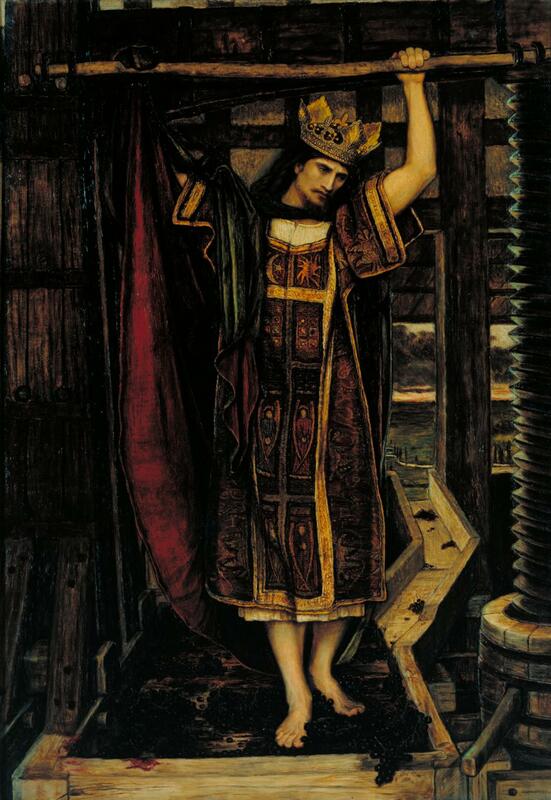 Although a classical Victorian moralist painting, Stanhope’s style is Pre-Raphaelite. It has been claimed that his model was Fanny Cornforth, who was just becoming Rossetti’s mistress, but there appears to be little resemblance between the woman seen here and Rossetti’s later paintings of Cornforth. Robin of Modern Times (1860) is a highly original wide-angle composition, and one of the most visually-arresting paintings made at this time. It is set in the rolling countryside of southern England, during the summer. 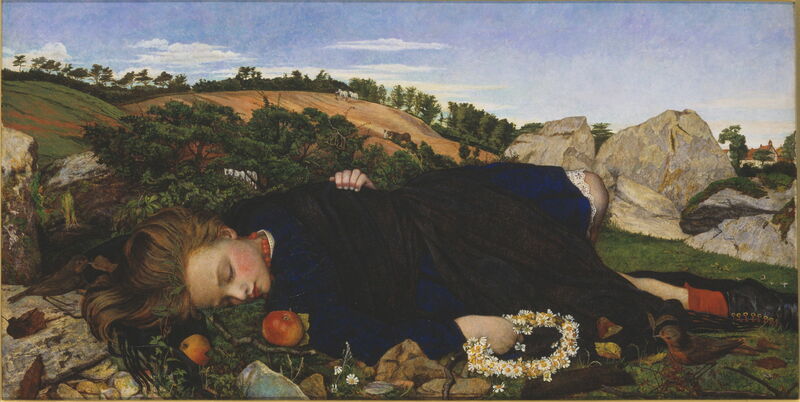 The foreground is filled with a young woman, who is asleep on a grassy bank, her legs akimbo. She wears cheap, bright red beads strung on a necklace, and a floral crown fashioned from daisies is in her right hand. She wears a deep blue dress, with a black cape over it, and the white lace of her petticoat appears just above her left knee. On her feet are bright red socks and black working/walking boots. A couple of small birds are by her, one a red-breasted robin, and there are two rosy apples near her face. In the middle distance, behind the woman’s head, white washing hangs to dry in a small copse. A farm labourer is working with horses in a field, and at the right is a distant farmhouse. This painting most probably refers to the popular contemporary account of how girls and young women from the country around London were claimed to find their way to the city, to become its prostitutes: an almost identical narrative to that of William Hogarth’s A Harlot’s Progress (c 1731). It is possible that in this case Stanhope makes the visual suggestion that she may be in post-coital sleep, with her bare legs akimbo, hair loose and tousled, and flushed cheeks. As such it may have been a pendant to Thoughts of the Past, and has two visual links to it, in the necklace and lace, although this woman is not a redhead. The Wine Press (1864) has been described as Stanhope’s finest work, and was inspired by a visit to Varennes, where the artist saw peasants treading grapes in a winepress. He made an earlier watercolour and gouache study which also survives. The figure is most probably that of Christ, who is shown both as the victim and the conqueror. He wears a white undergarment symbolising his spotless humanity, over which is a surplice as worn by a High Priest, and the crown of a king. Although critics drew comparison with Holman Hunt’s famous The Light of the World (1851-3), Stanhope’s niece denied any such influence. In the late 1870s, Stanhope started to paint in egg tempera, contributing to its revival. Among the works which he painted in tempera is Love and the Maiden (1877), which is also considered to be one of his finest works. Its style shows influence from Burne-Jones and Rossetti, but its content has changed markedly from his previous Pre-Raphaelite paintings. A winged male bearing a bow kneels over a young woman, who is looking at him. In the distance three young women (possibly Graces) dance, by an androgynous figure. These are all in a grove, in which there are abundant flowers, and the whole scene is thoroughly Grecian in appearance. At the left edge is a glimpse of distant countryside, which includes regular arrangements of standing stones similar to Stonehenge, set on a hilly coast. This painting was first shown at the Grosvenor Gallery in 1877. 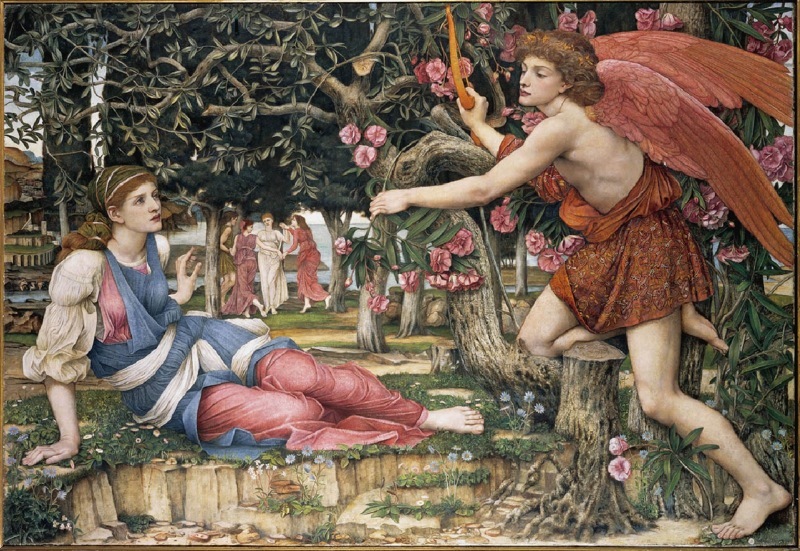 Stanhope painted two similar versions of The Temptation of Eve (c 1877), this being the less realist; the other, painted in tempera, was first shown in the Grosvenor Gallery in 1877. Eve is shown holding an apple on the tree in her cupped left hand, her long hair twisted around her body as an echo of the serpent’s coils. The serpent’s human face – a form which harks back to Bosch and before – is next to Eve’s, as it whispers into her ear. 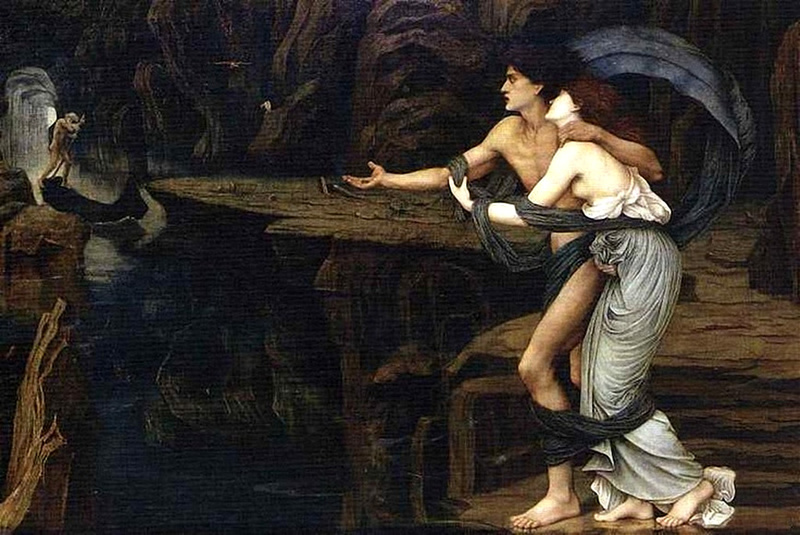 Orpheus and Eurydice on the Banks of the Styx (1878) calls on the popular classical legend of the ill-fated couple. Euridyce died of a snake-bite, and Orpheus was allowed to descend into the Underworld and take her out again. They are seen summoning Charon the boatman to take them back across the rivers Styx and Acheron. Stanhope here shows influence from the later works of Burne-Jones. John Roddam Spencer Stanhope (1829–1908), Flora (1889), oil on panel, 128.9 x 52.7 cm, Private collection. Wikimedia Commons. His panel showing Flora (1889), the goddess of spring and flowers, is simple apart from its decorative row of angels, and abundant flowers. John Roddam Spencer Stanhope (1829–1908), Why seek ye the living among the dread? (St Luke, Chapter XIV, verse 5) (1896), oil on paper, 15.3 × 22.8 cm, location not known. Wikimedia Commons. Why seek ye the living among the dead? (St Luke, Chapter XIV, verse 5) (1896) refers to the well-known resurrection scene in which Mary Magdalene and companion(s) return to Christ’s tomb, only find its door open and the tomb empty. They are then greeted by two men who inform them that Christ has risen from the dead. Stanhope depicts this in the style of a frieze, the four figures arranged across the painting in a single parallel plane. Although part of a quite complex Gospel narrative, he depicts only a limited window from the story, and in doing so makes his painting simpler and more direct than his earlier narrative works. 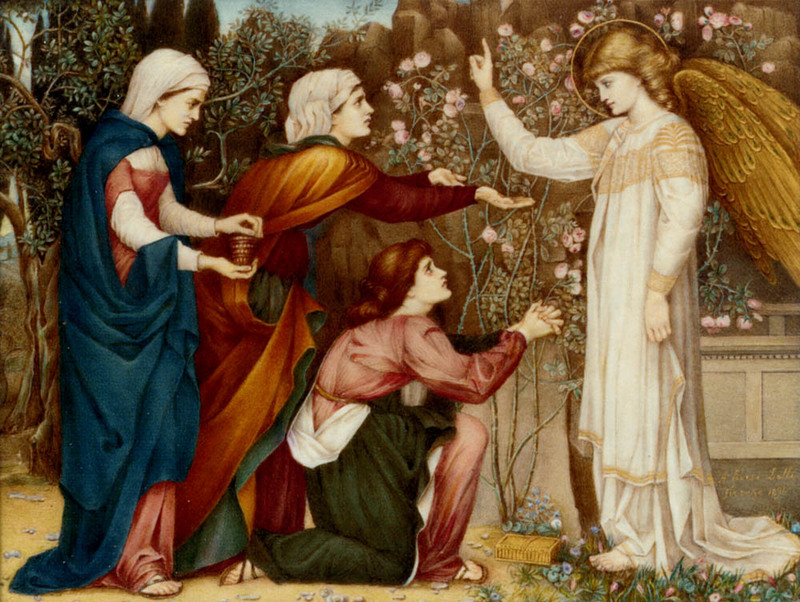 As with Dante Gabriel Rossetti and Frederic, Lord Leighton, John Roddam Spencer Stanhope’s work changed over time. His early paintings had Pre-Raphaelite qualities, but from the 1870s their narrative became shallow or was lost altogether, as he apparently became increasingly Aestheticist. Posted in General, Painting and tagged Aestheticism, Burne-Jones, De Morgan, Hogarth, Hunt, painting, Pre-Raphaelite, Prinsep, Rossetti, Spencer-Stanhope, Stanhope, Stillman. Bookmark the permalink. When you described Robin of Modern Times (1860) you said ‘In the middle distance, behind the woman’s head, white washing hangs to dry in a small copse” — I just saw the painting in person, and I think the white dabs in the trees are another team of white horses, like the ones on the hills behind the girl. If you get close, you can see the first horse’s head on the left, the dark collar and harness, a few tree branches in the way, and then the second horse’s tail coming out from behind the first one. At the lower right you can see the individual back legs. I dunno why these folks need three teams of horses, but, it’s not laundry. Thank you for that useful information: that’s a detail not clear on the electronic image.